I am in the Nick Saban school of game-day preparation: process is everything. Studies show that students who imagine themselves performing well on a test actually perform worse than a control group. The explanation behind this counter-intuitive fact is simple: performance is a product of preparation, and students who imagine themselves doing well are less likely to prepare as intensively. Process is everything: from what you eat, to how you sleep, to how you practice, and manage your life outside of that process. In this article, I want to focus on one particular aspect of any preparation process: developing a gauntlet of decks to test against. I will offer some specific suggestions for decks you may wish to include on your gauntlet for the 2013 Vintage Championship, based upon my experience competing in the Vintage Championship (I have 3 Vintage Champs Top 8 finishes thus far). To assuage any perceived conflict of interest (since I will be competing in this event), let me confess at the outset that I am far from settled on a deck for this tournament, and, furthermore, put out there that I am typically associated with Gush and Combo strategies like Doomsday and Burning Tendrils, two decks I created and developed in the last few years, and which have had many recent Vintage tournament Top 8 appearances, in case that colors your view of my recommendations. Unlike the last 10 years, the Vintage Championship this year will be taking place in Philadelphia (PA), and not in Indianapolis (IN). This should have some impact on the metagame, since the metagame will have less of a Midwest emphasis. Moreover, the metagame will undoubtedly be predominantly Northeastern. Given the regular tournaments in the region, it should be relatively to easy to construct a fairly accurate metagame prediction within 15-20% of the actual metagame by examining regional tournament results, both metagame breakdowns offered by tournament organizers and the accompanying Top 8s. In particular, the Topdeck Games tournament breakdowns, such as this one from July, are especially useful for generating such a prediction. In addition, the eastern Pennsylvania tournaments, such as the MVPLS results, like this one from September, are also indicative of the larger regional metagame. There are three sources of information I recommend you study. First, consult Morphling.de‘s Top 8 tournaments results for a general sense of both global Vintage metagame trends and specific Eastern US results going back as far as you want. Second, examine tournament announcements in the Northeastern US, which are posted here on TheManaDrain. Third, review tournament results, including metagame breakdowns, on TheManaDrain’s tournament results forum, which has results and information not available on Morphling.de. Collating and analyzing these three sources of information will give you more than enough data to both project and predict a fairly accurate metagame. There is, however, information that cannot be gleamed from tournament results and regional data. An insider’s understanding of the operation of the format and the proclivities of the players is also helpful. An experienced-based understanding of how this event might differ from other regional tournaments is also important. The Eternal Weekend differs from regular Vintage tournaments in at least two respects. First, it is zero proxy, which means players will be more likely to play slightly suboptimal decks because they may be unable to find necessary or important cards. Second, it means there will be players who are playing who do not regularly play Vintage, such as pros or Legacy regulars who will be attending the tournament because of the convenience that it is the same weekend. In such an environment, I expect archetypes like Dredge to be slightly more popular than normal. Dredge is an archetype that only requires 4 Bazaar of Baghdads to compete, rather than a complete set of Power 9 and other relatively expensive cards. 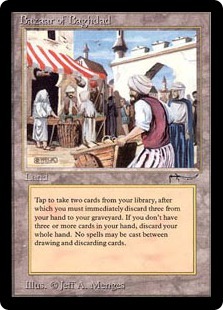 Vintage players who own Bazaars but do not wish to play Dredge may be inclined to loan Bazaars to friends, enabling them to compete with a complete high-level deck, rather than a weakened version of a normally ‘Powered’ archetype. Dredge is a linear deck that does not require a great deal of format knowledge, although it does require mechanical precision, which makes it an ideal deck choice for unpowered pros who wish to have an upper tier deck to compete. I expect Dredge to be a serious competitor for Top 8. Last year’s Vintage Championship had 2 Dredge decks in the Top 8. Lance has a transformational sideboard plan you should familiarize yourself with in case you encounter Lance’s list in the tournament. Another very popular regional favorite is Workshop Aggro and Workshop Control, and hybrids thereof. Nick Detwiler, the tournament organizer who ran this past summer’s NYSE Open, is particularly fond of Workshops, and many of his teammates are Workshop experts. Raffael Forino Top 8’ed last year’s Vintage Championship with Workshops. If you face Mr. Forino in the tournament, chances are he is playing a well-metagamed version of his Workshop deck, often known as “Espresso Stax” or NYSE Stax. Nick Detwiler recently Top8’ed several local tournaments, which suggest potential ways in which he and his teammates may be preparing for the metagame. It seems that Nick has moved towards Steel Hellkite and multiple maindeck Ratchet Bombs to help combat the rise of Young Pyromancer. I expect a strong contingent of Workshop pilots. If you cannot compete with Workshops, you have little chance of winning the Vintage Championship. This kind of deck is worth testing to stress test your Vintage Champs strategy against more purely aggro-bbased builds. Still another form of Workshops that you may run across are the Kuldotha Forgemaster-based versions, which utilize less lock/prison components, and often run some combination of Forgemasters, Metalworkers, Phyrexian Revokers, and a number of singleton artifact tutor targets that can be pulled up with Forgemaster. This variant is much more common in Europe, but can still often be seen in tournaments in the US. Here are some examples on Morphling.de to compare. If there is a favorite to win the Vintage Championship every year, it would be a deck of this style and approach: a Mana Drain based Combo-Control deck that is uniquely and skillfully metagamed (such as Paul’s was this year, and Marc’s last year) piloted by a strong player. This style of deck has won most of the Vintage Championships in the last decade. Confidant/Jace Control with these cards has won three of the last four Vintage Championships. It is the odds on favorite to repeat again. Players like Brian DeMars are particularly skilled at examining and analyzing the metagame and then producing a very well tuned and metagamed version of this basic archetype. 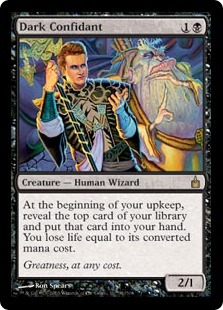 Paul Mastriano, similarly, is fond of playing a deck built around the best cards: Time Vault, Tinker for Blightsteel Colossus, and Yawgmoth’s Will. It is worth putting together a deck like Paul’s or Marc’s to see how you fare against it. Josh Potucek is one of the most consistent performers in the regional metagame, and has made a name for himself with variants of the following Landstill deck, which he Top 8’ed with at the NYSE Open I.
Landstill is a deck that may have small numbers of players piloting it, but gets highly skilled pilots behind it, like Chris Pikula and Josh. Even if you don’t expect to face it, it is worth testing Landstill to gauge your deck’s pressure points. Another popular and potent option is the BUG Tempo deck, which recently won the largest Vintage tournament of the year, the 2013 Bazaar of Moxen in May. These decks both seek to disrupt the opponent enough to take advantage of the tight windows of opportunity that Vintage provides, beating down while trying to exploit the opponent’s mana or tempo bottlenecks. This strategy mirrors those often seen in Legacy, where decks like RUG Delver, Grixis Delver, and Shardless BUG play similar roles. This is a natural transition for players coming over to Vintage from Legacy. Lastly, Doomsday is another combo deck on the rise. Mike Solymossy and Sam Krohlow both Top 8’d the GenCon Saturday Vintage tournament with Maniac Doomsday, with slightly different sideboard strategies. Solymossy chose to run red for access to Ingot Chewer, while Krohlow went with a transformational Oath of Druids sideboard. You can read more about building and playing this archetype in my Vintage Maniac Doomsday primer. These are some of the decks and strategies you can expect to face at the Vintage Championship at Eternal Weekend. I hope to see you there!